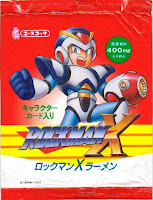 Rockman Corner: Instant Rockman X Noodles! 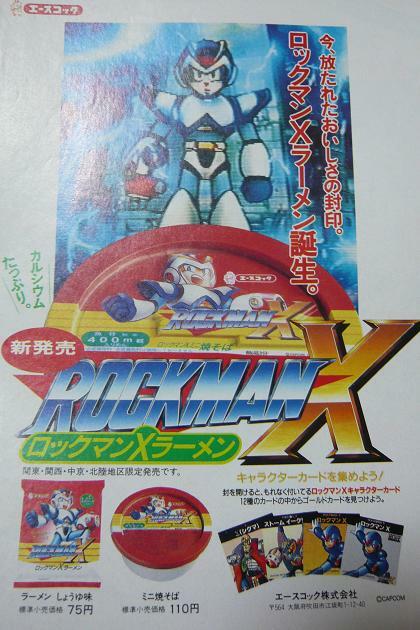 In the buildup to the release of Rockman X, a hefty cross-promotional advertising campaign permeated Japan. 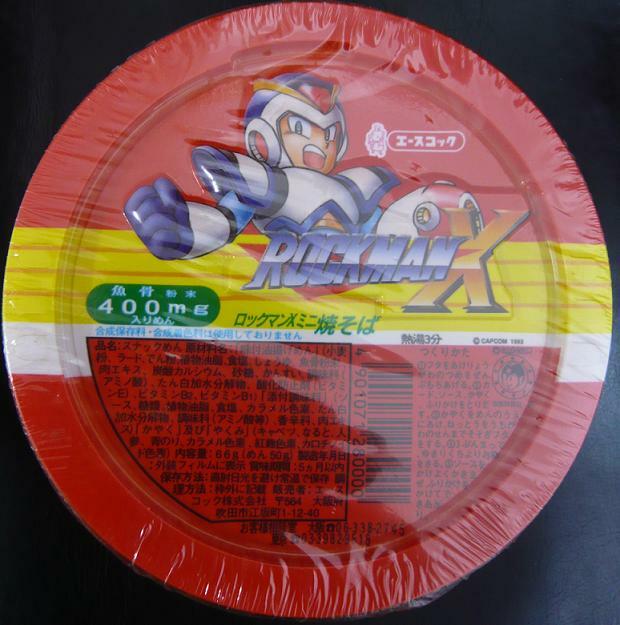 There was all sorts of X-themed trinkets and doodads, but none more tasty than packages of Rockman X-branded noodle soup and packets of ramen; byproducts of Capcom's partnership with Acecook. For children, these treats were impossible to resist due to the embossed X packaging and the promise of free collectible trading cards. For the starved college students in a hurry, it was a enduring favorite. The enclosed trading cards were entirely random, so you can imagine some bright young thing grabbing a whole shelf's worth of packages in an attempt to collect 'em all. Fortunately, the endeavor wasn't costly, what with packs selling for as little as 75 to 100 Yen a pop (a dollar-ish). Today, sealed packets have been sighted on the auction block for a couple thousand Yen. In all my years of scoping out Yahoo! Auctions, I've only come across one set, albeit devoid of trading cards. And yet, I'd rather starve myself than eat 19-year-old food. By and large, these artifacts are just another example of the franchise's ability to branch-off to virtually every piece of merchandise imaginable. And yes; my Mega Man pajama/underwear post is in the works. That should be loads of fun! This is why I love your blog, Protodude. 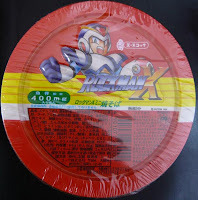 I remember seeing these at a asian grocery store back around 1994, it was possible to find these in the us at the time at a few asian grocery stores. Yummy! (sees validation date) Yuck! It appears those sites are selling the rare Tron ni Kobun telephone card. I heard there are two types of TnK phone cards, but without images can't tell which one(s) they are.